With the new utility and the upcoming investment app, the CHSB token has entered a new dimension. 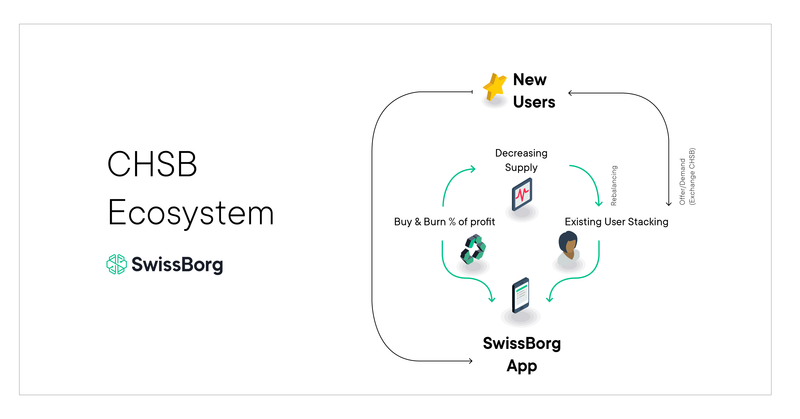 This article aims to present the potential future evolution of the SwissBorg token’s price. To complete what follows, we invite you to browse these sources of information. 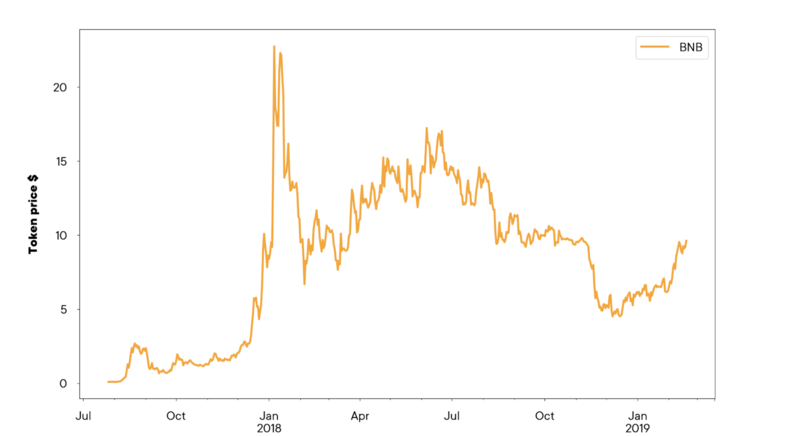 One of the most, or arguably, THE most damaging criticism coming from the off-chain world is related to the actual valuation of crypto assets. Reputable names such as Warren Buffet, Robert Shiller, and Charles Munger have used harsh words, like “rat poison squared”, to proclaim that crypto assets have zero value. Surprisingly enough, the companies with the highest market capitalisation, such as the FAANG stocks (Facebook, Amazon, Apple, Netflix and Alphabet), also did not initially fit the past and present valuation models once they emerged but are now generating massive profits. For the general public and off-chain investors, below are the most common models or tools to value a company and/or its stock price. The above valuation models don’t really apply to most blockchain companies due to the fact that their underlying tokens are not linked to profits or offer dividends. This application of old models to crypto companies is the primary cause of concern and the reason behind the harshest criticism from traditional investors who tend to insist that crypto assets have zero intrinsic value. In the past couple of decades, newer valuation models measuring network effects were introduced and effectively used to value innovative companies like Facebook at the time of its IPO. This valuation model was named Metcalfe's law. Other tech giants like Google, Netflix, Twitter also used Metcalfe’s law model and embraced scale by building massive user networks. Although there will never be a perfect valuation model, as Tom Lee, chief technician at Fundstrat, considered one of the most popular analysts in the crypto space, emphasises, Metcalfe’s law is a lot more suitable to measure value for tech companies with protocols that rely on user adoption. This valuation model prioritizes the value of a network (here is how it is specifically being used for the crypto market). If you are curious about models to measure tech-specific valuation, although losing popularity recently, Moore’s law also stresses the importance of the network effect. There is no such thing as a perfect valuation model and since the future is included as part of the equation, all of these models, without any exceptions, are contingent on inherently difficult-to-predict future events and external factors. Fixed mindsets are created due to the habit and comfort of using specific valuation models over time. It is very important for us, as a community, to keep challenging and adjusting our models to adapt to the evolving and dynamic space such as technology as a whole and cryptocurrencies as a specific example. Just food for thought but perhaps whenever someone criticises the value of something new, ask them that simple question. 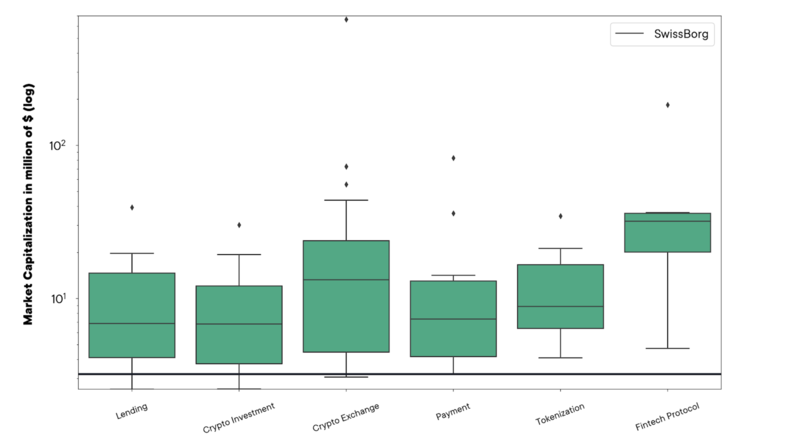 Since intrinsic value has its limitations in terms of valuing tokens, we have decided to use the relative approach in analysing the dynamics of tokens below. The Blockchain Fintech ecosystem can be divided into 6 sub-sectors: Exchange, Invest App, Protocol, Payment, Lending, Tokenization. These subsectors are not necessarily independent and cross-collaboration between sectors is possible. As the industry is in its early days, crypto exchanges and crypto investment sub-sectors are competitors for now. Nevertheless in the long run exchanges will be used by short-term investors (i.e traders) and investment apps by mid/long-term investors. And, when the industry will mature enough, collaborations will start to flourish. Thus, the CHSB token now belongs to the "crypto investment" category. The actual importance of the different sub-sectors in terms of market capitalisation is illustrated below with, in black, the market capitalisation of the CHSB token. The players from the Crypto Exchange and the Crypto Investment sectors are ranked below in terms of market capitalisation. 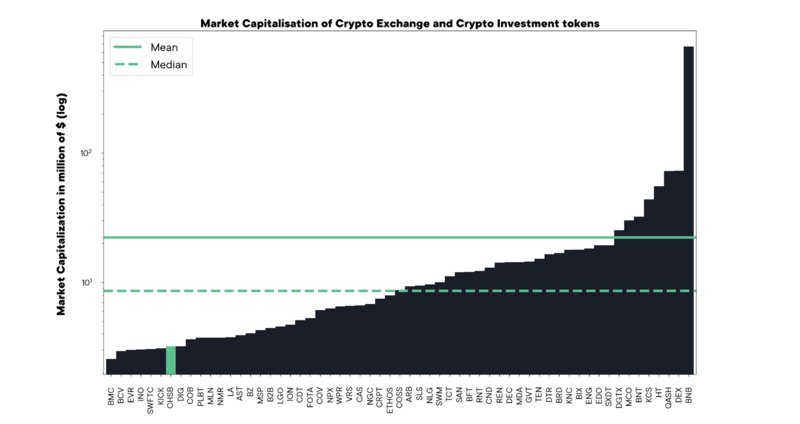 It appears that a token stands out from the set: the Binance token (BNB) with a market capitalisation higher by an order of magnitude of the rest, at least. The BNB is not the oldest tokens on this list and its performance is not a coincidence. Before discussing the CHSB token valuation, let's analyse the reasons for the extraordinary success of the BNB token. 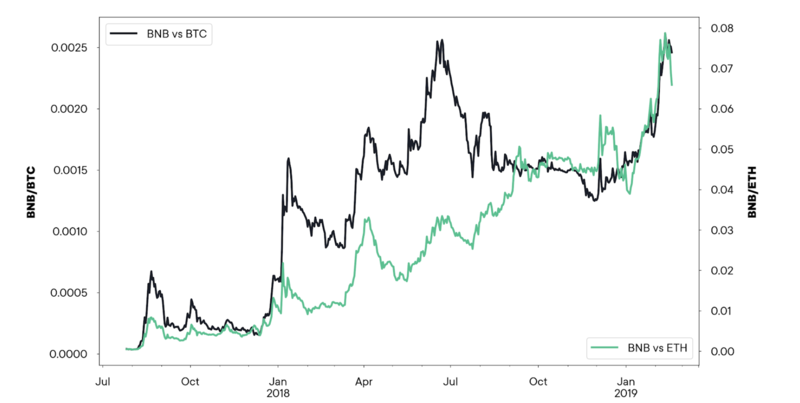 The relative performance of the BNB versus ETH and BTC shows its resilience capacity even during a bear market. The reason behind the success of the BNB is both its design in terms of utility listed below and the success of the Binance trading platform (i.e the number of users or, in other words: its community). The burning mechanism is an interesting concept that allows to gives stability, as it increases the demand and lowers the supply (cf BNB/BTC, BNB/ETH graph). Binance Ecosystem is a massive success due to an extremely well-designed token and a very supportive community. Binance has created utilities that put the token at the centre of the ecosystem and link the performance of their product with their community. Disclaimer: The following section is destined to be used purely for guidance, informational and educational purposes. All information contained herein should be independently verified and confirmed. We do not accept any liability for any loss or damage whatsoever caused in reliance upon such information. The information provided in this section does not constitute investment advice, financial advice, trading advice, or any other sort of advice. Nothing on this section should be taken as an offer to buy, sell or hold CHSB tokens. Stacking CHSB tokens allow the user to have a discount on the trading fees up to 70% on the upcoming investment app. Therefore, with these new utilities, the value of the CHSB will be strongly linked to the amount saved on fees by the users and the number of tokens needed to stacked (which will be rebalanced according to the change in supply). The discounted fees will be calculated based on the total equivalent of CHSB tokens in USD (e.g. : 15$ of CHSB token will give access to 70% discounted rates). In other words, in our ecosystem, as the value of the CHSB token rises, we expect that the investment app users will gradually sell tokens to have the bare minimum amount of tokens to take advantage of the highest discounted fees. As a result, some of the previously purchased CHSB tokens may be sold back. With these mechanisms and the increasing number of users on the application (accelerated through our community), we expect that an equilibrium will be found between the demand for new users and the tokens that will be sold from existing users after the rebalancing. In addition, the buyback-burning mechanism, as well as the rebalancing, will provide additional liquidity. In practice, how will these utilities be reflected in the price? By simulation, it is possible to project the price change of the CHSB Token according to the different expected number of users. In summary, the intrinsic CHSB token value at a given time is evaluated by the savings induced by the CHSB staked by the users on the application. In addition, the “BB” (buyback-burning) mechanism decreases the supply. 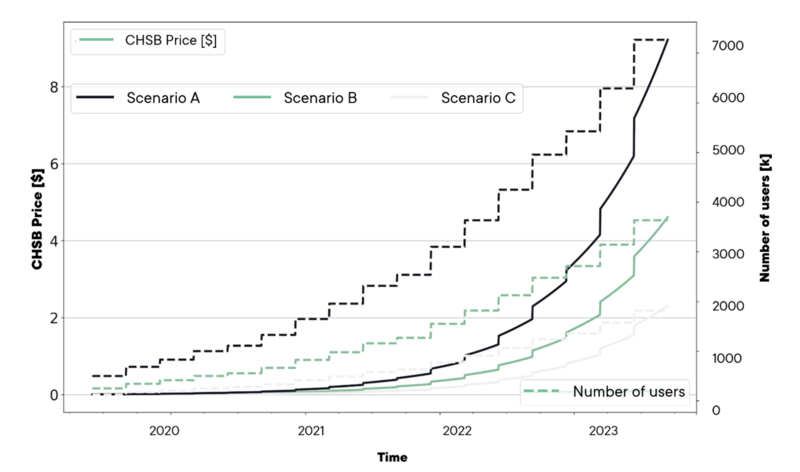 On the figure and the table below, the evolution of CHSB token price according to three different growth scenarios (optimistic “A”, intermediate “B” and pessimistic “C”) are presented. CHSB token price for different users growth scenarios with the new utility. It is important to note that the token price is considered and not the whole market capitalisation as the supply will also be impacted after each burning phase. Based on the effect of these new utilities, and different reasonable projections of the number of users, we find that today, the intrinsic value of the CHSB token is underestimated. Indeed, the current price is below the most pessimistic valuation in terms of the number of users. Classical company valuation methods can hardly serve the purpose of the pricing of a digital company such as Snapchat or Facebook. Nor can old methods of valuation serve the purpose of evaluating crypto tokens. It is, therefore, essential for the future of the blockchain economy to be creative, think outside of the box and invent new valuation models. In our case, we came up with an innovative model taking into account both the potential growth of our network in the future (i.e an increasing amount of investment app users) and the discount on fees of stacked CHSB. The simulation shows that the CHSB is clearly undervalued. 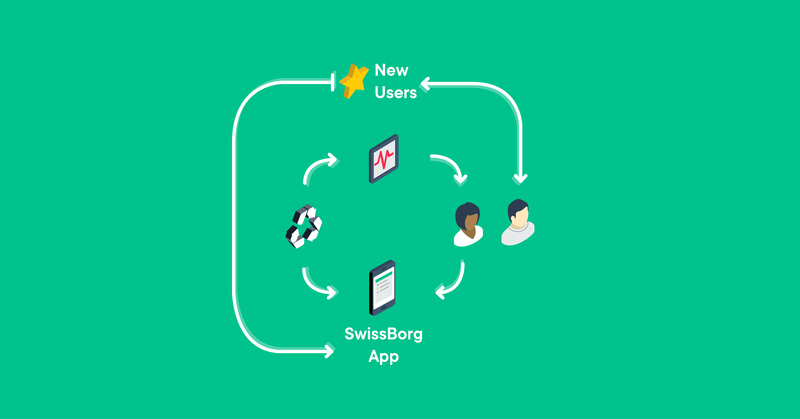 The CHSB is the key to an ecosystem that is directly linked to the success of the SwissBorg Investment App, and more importantly, to the strength of our community that will allow us to consolidate growth. Studying communities as a measure of value is revolutionary. For the first time in the history of finance, individual contributors are important factors in the success of a project. Our community is more than just a network it is the gold standard backing our CHSB token. It is simple: the more you share the news of our App the higher the chance of seeing the value of CHSB grow. Join us in our journey to change the world not with this app alone, but with embracing the community-centric approach acting as its launch engine.